1998 renovation by Vandeberg Architects. 14th Street and 9th Ave.
You’ve stumbled upon a one-stop, NYC culinary food shop, a gourmet lover’s wholesale-retail wonder world, and an energetic, industrial-chic hotspot, all meshed into an entire city block of space in the heart of West Chelsea. Chelsea Market’s 800-footlong concourse opened in April of ‘97, but the million square feet the market occupies has a big history that begins with the birth of the first Oreo Cookie™ and a fitting future as the home of the Food Network, NY1, Sterling Sound, Oxygen Media, and Major League Baseball Productions. Check the calendar for events, or swing by everyday for fresh sushi and a chocolate-almond croissant. Sip a little cappuccino in a free Wi-Fi environment, decorated with stone sculptures, a new façade, copper walls, a rotating photo gallery and an indoor waterfall. Then pick up your meat, produce, wine, cheese, bread, flowers, and everything else you might need for a perfect meal. In 1792, the Pearsons & Sons Bakery opened in Massachusetts, making a durable biscuit, called pilot bread, for sailors on long journeys. In 1801, the Josiah Bent Bakery made a biscuit that was nicknamed a "cracker", because of the sound it made when bitten into. In 1889, William Moore merged these two and six other bakeries into the New York Biscuit Company. The factory, office and railroad complex in Chelsea, between 9th and 11th Avenues, was built between 1890 and the mid 1930s. In 1912, the Oreo Cookie was first baked here. NABISCO left the complex in the mid 1940s, but all the buildings, including the railroad shed and the High Line, are intact. The 11th Ave building has been renovated over the past several years for commercial tenants. 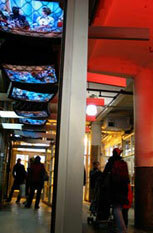 The buildings between 9th and 10th Aves are now the home of the Chelsea Market, a unique shopping experience. 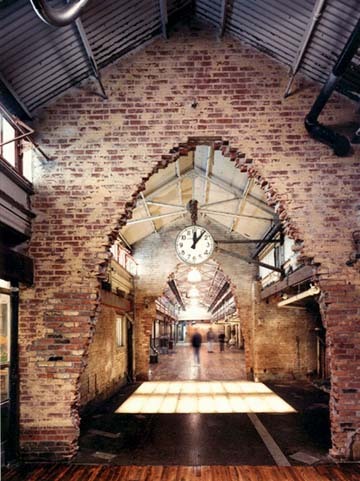 In 1998, the renovation work was performed by Vandeberg Architects. Brass spandrels were woven into the 9th Ave brick facade (looks like a Triscuit), and a glass and steel canopy added. WHEN Irwin Cohen bought the old industrial building nearly 10 years ago that became the Chelsea Market, the area around Ninth and 10th Avenues was a desolate, windy stretch with little pedestrian traffic and absolutely no cachet. 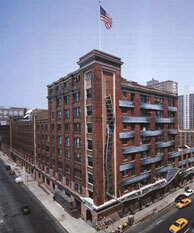 For more than 50 years, beginning in the 1890's, the building had been part of a large factory operated by Nabisco. One of its most glorious moments came in 1912, with the production of the first Oreo cookie. Now, of course, Mr. Cohen looks prescient. 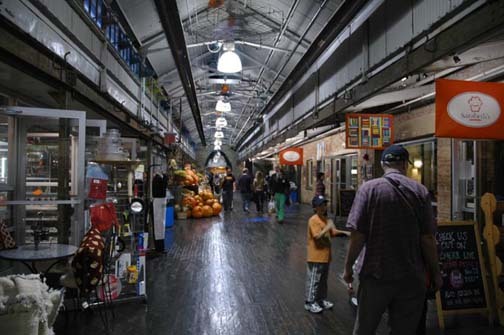 Chelsea Market, where the brick walls, wood floors and exposed pipes glorify the building's industrial past, is a bustling collection of businesses, most involving food — sometimes raw, more frequently prepared. It is near the new stores and restaurants of the meatpacking district and not far from the art galleries of west Chelsea. 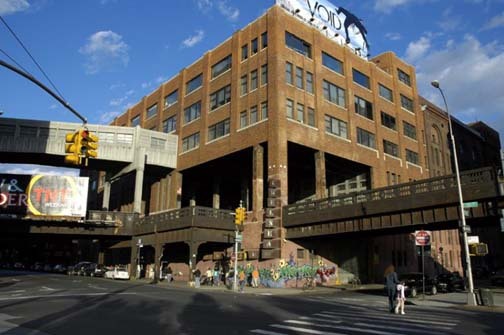 With that success behind him, Mr. Cohen early last year made his second large investment in the area when he led a group that purchased the other half of the old Nabisco property, at 85 10th Avenue opposite the Chelsea Market property, paying $57 million, according to city records. Just like the lobby of the Chelsea Market, the lobby of his more recent acquisition reflects Mr. Cohen's penchant for unusual aesthetic choices. On the 10th Avenue side, there is a forest made up of old gas-lamp poles embedded in concrete, and on the 11th Avenue side, a tree made of steel bars, usually used to reinforce concrete. The lobby also has a wall covered with shiny metal plates, and props from a Broadway musical. Before Mr. Cohen developed the Chelsea buildings, he turned some old factory buildings in Long Island City, Queens, into multitenant properties. He was unconventional there as well. At one location he took an old water tank down from the roof, painted it and installed it in front of the building as a sort of landmark. The building at 85 10th Avenue is already home to the venerable Frank's, a steakhouse on the 15th Street side. Scheduled to open next year on the 16th Street side is Il Posto, a 400-seat Italian restaurant owned by the noted chef Mario Batali and the mother-and-son team of Lidia and Joseph Bastianich. It will join two restaurants being built in the Chelsea Market building, both by the Philadelphia-based restaurant owner Stephen Starr. One will be a two-story restaurant and lounge called Morimoto, after Masaharu Morimoto, a former Iron Chef on television. (His former broadcaster, Food Network, has offices on the upper floors of the Chelsea Market building and studios in a new structure on the roof.) Mr. Starr's other restaurant, on the Ninth Avenue side, will be Buddakan, the New York version of his Pan-Asian restaurant in Philadelphia. Mr. Cohen and his group bought the building at 85 Tenth from Level 3 Communications, a company that provides telecommunications services to Internet companies. It had bought the building in 1998 during the dot-com boom to house equipment to handle the anticipated surge in Internet transactions. Since telecommunications companies make reliable service one of their selling points, the building was equipped with emergency generators to supply power in the event that utility service was cut off. 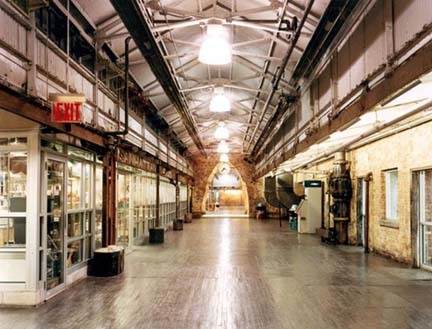 To feed the generators and the cooling units needed to keep the sensitive electronic switching equipment at the proper temperature, large tanks for diesel fuel and water were installed in the basement to allow the building to operate independently. Those facilities remain, and Mr. Cohen said the cooling system is capable of supplying three times today's demand. After many dot-com companies failed and the demand for telecommunications did not match predictions, Level 3 decided it did not need to own the building. "The company made a strategic decision it did not need to own real estate," said James P. Quinn, an executive director of Cushman & Wakefield, who represented Level 3 in both its purchase and sale of the property. He said the area had been attracting the attention of both retail and office tenants. 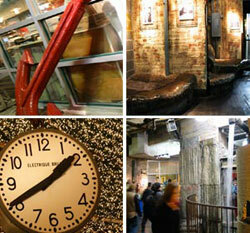 "Chelsea Market is pretty well leased up, and this building is an offshoot of Chelsea Market," he said. The company remains a tenant in the building, along with some government agencies. Mr. Cohen's group, which includes Angelo, Gordon & Company and Belvedere Capital, bought it. 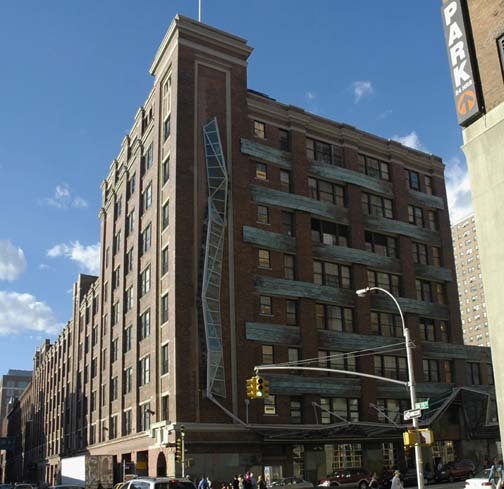 It was the second involvement with the building for Mr. Cohen, who had bought it originally along with the Chelsea Market building, then sold it to a group that later sold it to Level 3. 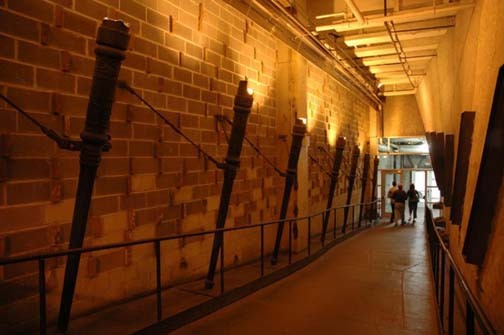 In addition to his unusual lobby furnishings (at the Chelsea Market, he made an urban waterfall out of a large pipe pouring water into a below-ground pit), Mr. Cohen is modifying the structure to meet the security needs of Level 3 and the government agencies. To do this, he has proposed putting additional doors in the 10th Avenue facade to provide separate entrances for other tenants on the available second and third floors, each with about 56,000 square feet of space. "We are talking about doing buildings within buildings, using the separate entrances," Mr. Cohen said. Separate entrances also mean that each business can have its own address and sign over the door to promote corporate identity. He said one floor may be rented to a cable television company that could take advantage of the building's 24-hour features like security, cooling and power. Another may go to a retailer seeking to sell clothing to the people flocking to the area's restaurants. Level 3 built a glassed-in entrance on 11th Avenue, but Mr. Cohen said he thinks that is unsuitable for other tenants because of the high volume of traffic rushing past on the West Side Highway. He said the space may be rebuilt with a different entrance and used for a restaurant or by some other food-related tenant. Although the lobby is not open to the public, Mr. Cohen said he plans to decorate the reinforcing bar tree for the holidays. "I enjoy lobbies that are alive," he said.